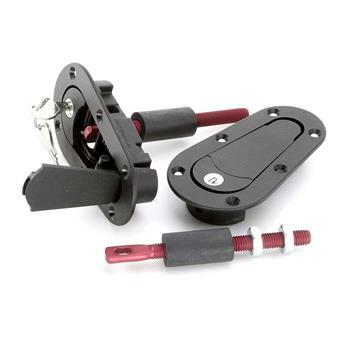 AeroCatch Latch Kit UNIVERSAL - MiataRoadster - Stay tuned with MiataRoadster! AeroCatch latches are the modern solution for securing hoods. Made of injection–molded fiber–impregnated plastic with stainless steel internal mechanisms, they are impervious to the elements and have been proven reliable on race cars around the world. The top surfaces of AeroCatch latches are composed of three components: the main housing with the flange, the flip-up latch, and the spring-loaded release tab. In the manufacturing process, a carbon fiber pattern film is applied to each of these three parts separately from one another. When the complete latch is assembled at the factory, there are invariably slight differences in the orientations of the “weave” patterns on each of the components. Don’t expect perfection in their appearance nor expect the latch to match the appearance of a real carbon fiber hood. With the top-mounted style, the flange overhangs and hides the edges of the hole that you must cut in the hood, so the shape of the hole you cut can be less than perfect. The bottom-mounted style leaves an exposed hole edge and thus requires more precision when cutting the hood for an attractive installation. Hole templates are included with all kits. The locking versions of each style offer deterrence against vandals who may be interested in the valuable performance upgrades under your hood. The keys are unique to each kit and both latches in each kit are keyed to match. Four keys are included with each locking kit. See the manufacturer’s site for installation instructions.